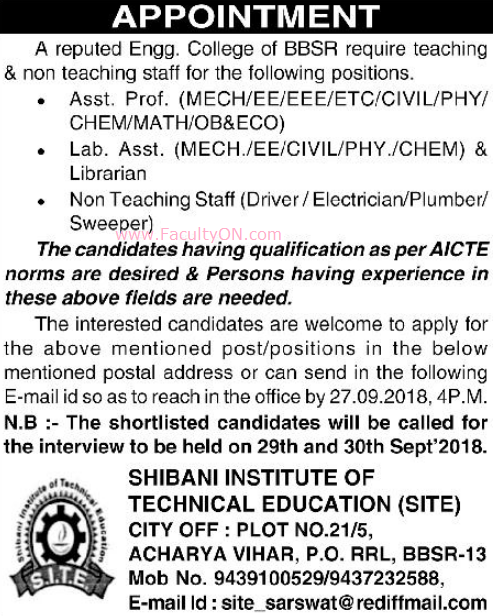 Shibani Institute of Technical Education, Bhubaneswar has advertised in the SAMAJA newspaper for the recruitment of Assistant Professor Plus Non-Faculty like Librarian, Lab Assistants and others jobs vacancies. Interested and eligible job aspirants are requested to apply on or before 27th September 2018. Check out further more details below. About College: Shibani Institute of Technical Education (SITE) is a premiere Technical Institution imparting technical education and offering B.Tech courses in several branches including Computer Science and Engineering, Electrical & Electronics Engineering, Electronics & Telecommunication Engineering, Mechanical Engineering and Civil Engineering. SITE is approved by AICTE, New Delhi and affiliated to BPUT, Rourkela, Odisha. How to Apply: Interested and eligible candidates are requested to submit application along with CV, xerox copies of certificates and PP size photo to the following postal address or email address. N.B: Shortlisted candidates will be called for interview which is to be held on 29th and 30th Sept 2018.